The Lake District offers some amazing views and difficult walks so it’s no surprise that it has plenty of places to put your feet up and enjoy a restorative pint. We know what’s expected of a good country pub, so we’ve compiled this list of the top 10 pubs in the Lake District. Ghyll, an old word for ‘ravine,’ is an appropriate name for this place, popular with climbers. The Old Dungeon Ghyll Hotel includes the Hiker’s Bar, which was formerly the hotel’s cow stalls. Open to all, it has open-mic night and live music on the first Wednesday of the month. The bar serves food and drink, with a selection of ales, Scottish whiskies, and a sizeable wine cellar. Unusually, they also deal in packed lunches, so you can have a picnic in the countryside if that’s more your thing. England’s tallest mountain and England’s deepest lake both sit in the parish of Wasdale and at its head sits this inn. Miles from anything, Wasdale Head Inn has been serving travellers for over two centuries, and it’s maintained its lakeland spirit throughout the years. Patrons are warmed by wood fires, and the walls are covered with climbing paraphernalia. The Inn is proud of its climbing heritage, and acts as a sort of base camp for many of the region’s tourists. Grab a chair by the fire, walk to the slate bar and settle down with some valley views. The Blacksmith’s Arms dates back to 1577, and needless to say it’s undergone many changes since then, but its character and charm have never got away. The internal structure hasn’t changed, either, with oak panelling, the original range, and hefty oak-beamed ceilings. The only pub in the Lake District on the National Inventory of Historic Pubs, this spot is a real time machine into the past. With a bar reserved just for drinking and a restaurant for the hungry bellies in the crowd, the selection of drinks and food is really quite impressive for such a cosy bar. Eltermere Inn‘s bar is resplendent with its beams, original slate floor, and roaring fire, a rustic counterpoint to the refined elegance of the other rooms. In 1756, William Robinson remodelled a farmhouse into a country residence, and this country home has been opening its doors and rooms to the public since the 1950s. The staff are just as warm as the bar, so the Eltermere is a pretty ideal spot to rest in between hikes. Perched above Ambleside is this simple building with a lot of character, even before you get to the unusual name. The bar is filled with oak: oak beams, oak floorboards, and oak furniture, set amidst framed art and hops hanging from the beams. The high set pub’s position gives it some really amazing views of the fells. The water for their home brewed beers comes from the surrounding area and this must be paying off for them, as the Duck’s Tag Lag beer won Bronze at the Champion Beer of Britain. This pub is set in the shadow of the ‘Old Man’ mountain and one of its stones (‘The Big Toe of the Old Man’) is set in the residents’ lounge. Coniston Brewing Company sits next door to this pub and the brews are all on sale at the bar. Real ales and lagers from the brewing company are available, alongside a slew of whiskies, ciders and other drinks. In the summer, or on other sunny days, there are two outside seating areas providing both warmth and shade. These create the perfect environment in which to enjoy a cold microbrew. Built in 1612, this pub proudly boasts that not much has changed since then, with the exceptions of electricity and central heating. As Bowness’ oldest pub, Hole in t’ Wall attracts a good mix of locals and visitors, drawn in by the ambience and warmth of the place. The split-level rooms are as you’d expect from a 1612 pub, with beams and open fires. Country oddments and pictures line the walls, as they do in any good historical pub. Outside, there is a small courtyard, with seating and outdoor heating for chilly nights. The Golden Rule is a pub for people who like their bars relaxed but lively. Priding themselves on creating the perfect environment for a pint and a chat, The Golden Rule is an unfussy pub attracting a great mix of people to fill out its clientele. The current landlord (and lady) have been in residence since 1981, and have been careful not to change the traditional feeling of the pub, without getting stuck in the past. Nip in here, pick one of the multiple rooms, and settle down for the aforementioned pint and chat. The Cuckoo Brow proudly welcomes muddy boots, wet dogs, and loud children, an unpretentious pub in the heart of Far Sawrey, a mere stone’s throw away from the National Trust home of Beatrix Potter. 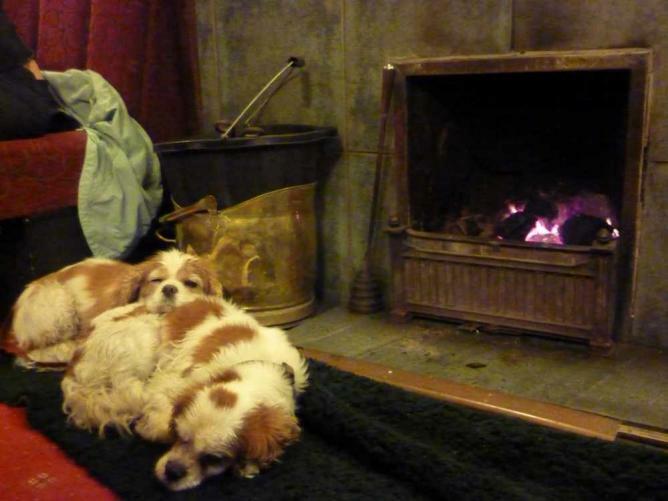 The B&B rooms offer dog friendly accommodation, for people bringing their pets along to the fells – it’s just one example of the small ways in which Cuckoo Brow aim to accommodate. The bar serves up a good selection of local ales, with Coniston getting one tap, Cumbrian Legendary Ales on the other and a third featuring a rotating selection of other local brews. A real middle-of-nowhere gem, The Masons Arms is a fellside pub with some fantastic views of the Lyth Valley. Tucked up on a steep hillside, the vistas are particularly pleasant on clear days, when the valley opens up before the eye, dotted with damsons. Damson features several times on the menus, a testament to the local focus that The Masons Arms possesses. Inside is atmospheric, with old fireplaces, low ceilings, and comfortable furniture adding to the warm ambience.